Not only do proper pH levels allow the other chemicals to do their work, but it is important to note that low and high levels can cause damage to your liner. Under the right circumstances with pH below 7.0, the liner can actually grow and develop unsightly wrinkles. High pH greatly accelerates the aging process and shortens the life of the liner. In most areas, the circulation range of 1.0–1.5 ppm of chlorine will do the job of killing bacteria in your pool water. Above this range, high concentrations will attack the liner, bleach it, and shorten its life, especially if pH levels are too low. Below the range may not kill bacteria, causing unsanitary conditions, possible liner staining, and unsafe swimming. Never let chlorine come in contact with your liner before it is fully dissolved. This means that granular or tablet chlorine is to be dissolved first in a bucket of water, and, likewise, liquid chlorine poured in various locations around the pool and immediately agitated, dispersed, and circulated. The broadcasting of tablets, granules, or concentrated chemicals can bleach the liner and shorten the life of the liner. Slow dissolving sanitizers should not be used in conjunction with automatic timers, unless precautions are taken to prevent concentrated chemical solutions from entering the pool. NOTE: Damage caused by improper addition or use of chemicals is not covered under your liner warranty! Another major contributor to shortening the life of a pool liner is dirt and grime at the water line. The “bathtub ring” is caused by the accumulation of airborne contaminants combining with dirt and body and suntan oils to settle on the liner, and can be baked into the liner by the sun. If the scum line gets baked in, it acts on the vinyl to prematurely dry and crack it, especially in the “sun corner” of the pool. To reduce this problem, routinely wipe the water line with a sponge (or a sponge with a mild dishwashing solution) to eliminate grime buildup. If grime buildup has occurred, be sure to use only vinyl cleaners recommended by our pool professional. Never use abrasive cleaners or pads on your liner. Do not use gasoline, kerosene, or other petroleum products either, as they WILL cause rapid deterioration of the liner. Never lower the water level of the pool to less than two feet of water in the shallow area. If water pressure is removed from the liner, it may shrink causing, at least, an unsightly liner, and possible tearing around the fittings or in the corners. Do not drain the pool. Call your pool professional! Use only vacuum heads, brushes, automatic pool cleaners, and other devices that have been specifically designed for vinyl liner pools. Never use the telescopic pole in the pool without the attachment. Abrasion of the print on your pool liner may occur as a result of the use of certain automatic pool cleaners, and this is not covered under the warranty. 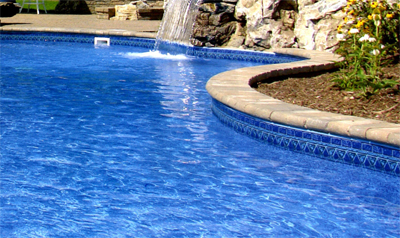 Not all cleaners cause the abrasion, so consult your pool professional for a recommendation. Clean the pool completely and make a surface inspection. Find out exactly how much water the pool is losing. Fill the pool to the correct operation level, make it, and record the drop, morning and evening, for a few days. A loss of ¼ to ½ inch per day may indicate evaporation. The cooler air at night will actually cause a higher rate of evaporation than the hot sun. Wind is also a factor, and splash out water should also be considered. A loss of ½ to 2 inches per day definitely indicates a problem. More than 2 inches lost should be an easily visible hole in the liner or a broken pipe or fitting. Shut down the filter and plug all inlets and outlets. If the water loss stops, check the plumbing by pressure testing the lines (by a pool professional) or restarting the pump and blocking the individual lines in series, and check for water loss in each. Don’t forget to inspect the waste line of your filter system for leakage.